Sometimes I like a very simple soup with minimal ingredients, like my Instant Pot Smoky Creamy Cauliflower Soup, which is very delicious. Other times I want lots going on in the bowl, as well as a lot of flavor. That would be this Instant Pot Creamy Chicken Gnocchi Soup. It’s amazing! This soup is loosely an Olive Garden Copycat Soup. Sort of. When I want a really comforting bowl of soup, this is one of my top 5 to make. 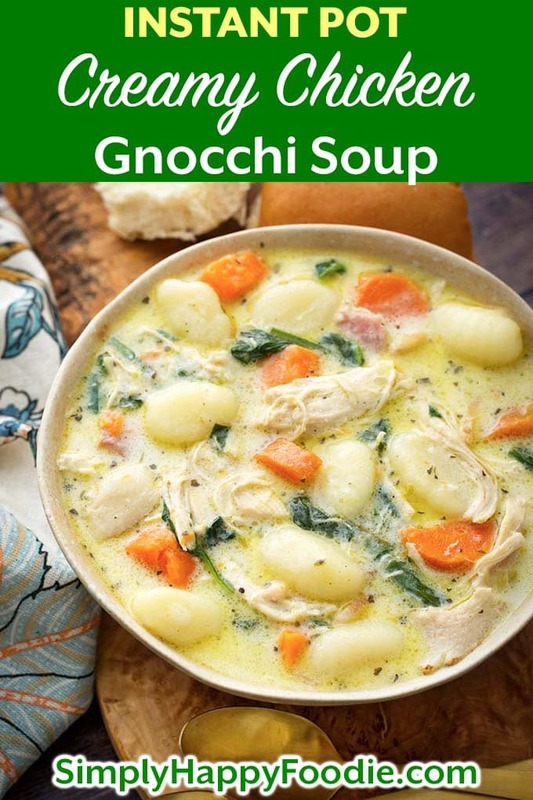 I used to think it was too involved to make a gnocchi soup, but when I found premade gnocchi in the store, I headed straight for my Instant Pot®! This is a good soup to share with friends. This time of year, as more of us are indoors and not venturing outside quite as much, gatherings around a comforting meal are a great way to catch up and reconnect. Why not host a small dinner party with a few people you had trouble connecting with throughout the year. 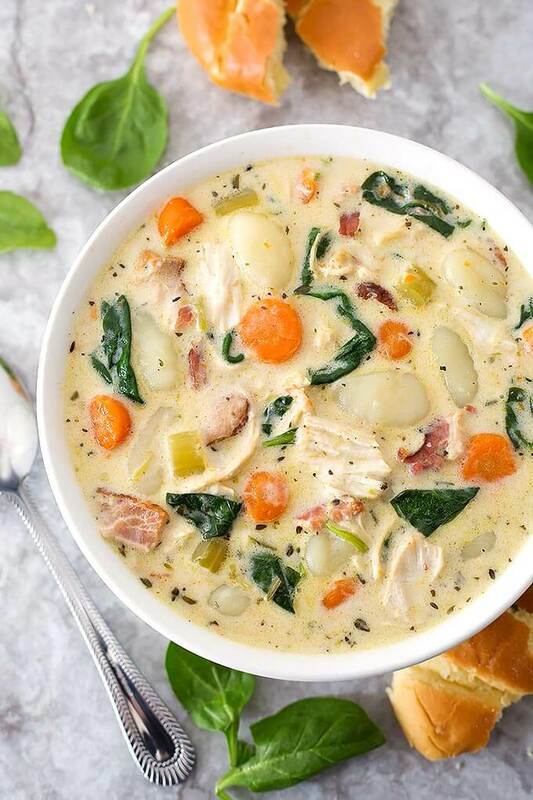 Make this Instant Pot Creamy Chicken Gnocchi Soup for your guests. Don’t forget the crusty bread! A rich and creamy soup that will quickly become a favorite! 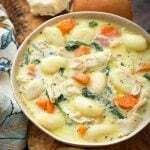 Instant Pot Creamy Chicken Gnocchi Soup has lots of flavor and is hearty and satisfying, yet elegant, too. Turn on the Sauté function (Med/Normal heat) and add the chopped bacon. Cook until mostly done. Add the butter, onion, carrot, celery, and bay leaf, and cook, stirring occasionally, for 5 minutes or until onions are just starting to turn translucent. Add the rosemary, basil, thyme, poultry seasoning, salt, pepper, and the garlic. Cook for about 1 minute, stirring frequently. Add the chicken broth. Stir. Put the lid on and lock in place. Set the steam release knob to the Sealing position. Press the Pressure Cook (or Manual) button or dial, and the + or - button or dial to select 9 minutes. High pressure. It will take several minutes to come to pressure. When cooking cycle has ended, let the pot sit undisturbed for 10 minutes (10 minute natural release). Next, turn the steam release knob to Venting (in short bursts until you are sure no soup spews out of the vent with the steam), and let the remaining pressure out. When the pin in the lid drops down, open the lid. Remove the chicken breasts to a bowl and discard the bay leaf. Turn on the sauté function again. Add the gnocchi and stir. Place the glass lid, if you have one, on the pot. If you place the pressure cooker's lid on the pot, make sure it is turned to Venting. Cook the gnocchi until it floats to the top. Just a few minutes. Meanwhile, shred the chicken breasts. When the gnocchi is finished, turn off the pot. Add the parmesan cheese and stir. Add the chicken back in, and the spinach. Stir. *If you are adventurous, you could make your own homemade gnocchi! Made this today and followed it to the letter. One of the best soups I’ve made. Thank you. Hi Matt! Wow, that is awesome! I’m glad you liked it! Thank you for taking the time to review this recipe! It’s one of my personal favorites! That’s awesome, Melissa! Thanks for letting me know! Thank you for the great soup recipe! Feeling tired today and this helped my spouse and I feel nice and cozy this evening. Hit the spot. Hi Charles! I’m glad you and your spouse enjoyed this soup! Thank you for the review! Thanks, Ryan! I’m glad you liked it! 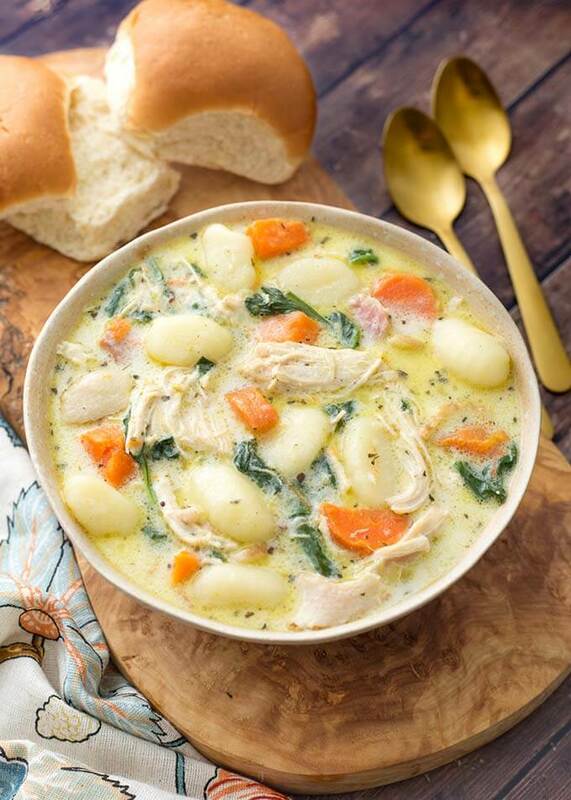 This is an absolute great soup recipe! One of the few things I can make that pleases everyone in my family of four! It’s also great in homemade bread bowls! Thanks for sharing! Hi Amy, thanks for the review! It’s nice when the whole family likes what you cook for them. Bread bowls… Now that sounds wonderful! This IS the best soup I’ve ever made. You are quite a talented cook to have concocted this amazing recipe. Thank you for sharing it! Hi Jane! YAY! I’m thrilled that this was such a hit for you! Thank you for taking the time to review this yummy soup! The recipe doesn’t say when to add the heavy cream and spinach. Am I missing it? Hi Charlotte, steps 18 & 19. You add them last as they only need to heat through. Enjoy! Hi Noreen, I’m happy you liked this soup! We do, too! Thank you for your review! What if I wanted to double the recipe? Do I need to set the InstantPot any differently? I made this 2 weeks ago, and it was such a huge hit, we didn’t have any leftovers!! What are thoughts?? You wouldn’t need to add any cook time, but you might need to be prepared for the pot to take longer to come to pressure, and for the natural release. A fuller pot takes longer in that regard. Also, just make sure your pot can handle the added volume safely. A longer natural release is recommended on a full pot of soup. Do you have any recommendations for freezing half before or after cooking? Hi Anjali, I like to freeze it after I cook it. I let it cool and put it in zip lock freezer bags. I freeze it laying flat, and then it doesn’t take up as much room in the freezer. How do you reheat it from frozen? Can you reheat in the IP or do you use another method since it has the cream in it already? I like to put it in a stainless bowl that fits in the IP and set it to Steam, High pressure, for 5 to 15 minutes. One of the best recipes I’ve ever made! Fantastic!! That’s so awesome, Elizabeth! We love it, too! I’m happy that you liked it so much! Thank you for your review! Made tonight – the first truly complicated recipe I’ve made in my pot. It was fantastic! Hi Angela! I know this is more than just a dump it in and push start recipe (and I love those). Thank you for taking a chance on it. It really is delicious, and I’m thrilled that you think so, too! I appreciate you leaving a review, thank you! I’ve made this multiple times now and its by far the best soup recipe I’ve tried. My friends and husband request that I make it more often. Thank you so much for sharing the recipe. Hi Shannon, thank you for the review! I’m thrilled that you and your hubby & friends like this soup recipe! I think it’s time to make a batch myself! Making this soup for the second time tonight, I’m altering it just a bit to mix it up, I used herbs de Provence instead of the ones in the recipe, I’m sure it will be just as good as the first time, just a little different! That sounds good, Julie! I like looking for an opportunity to use Herbes de Provence in a recipe! I’m so glad you like this soup, and are playing with the flavors. Fun! Thank you for your review, and let me know how that comes out! Hi, I assume you throw in raw chicken into the batch, correct? I have always made this soup on the stove top, can hardly wait to try this in my I.P. Awesome! I hope you like it! I love this soup so much! Forgot to get gnocchi so subbed canned white beans at the end. Fanrastic!! A hit with everybody! Yum! I just went looking for some gnocchi for another recipe I’m creating, and the store was out! I’m so happy you found a good substitute! Thanks for your review! I’m a dad that has started cooking to help out and this is my favorite soup now! I’ve made it twice now. I live in Alaska and have access to salmon and was wondering about cooking salmon in the instapot on this recipe. Thanks! Hi Aaron! Oh, I’m jealous! Though I live in Seattle, we don’t have access to salmon the way you do up there! I would try it, but the cook time needs to be reduced as the salmon won’t need much. Maybe 3 minutes. Thanks for the review, and let me know if you use salmon! Hi here! 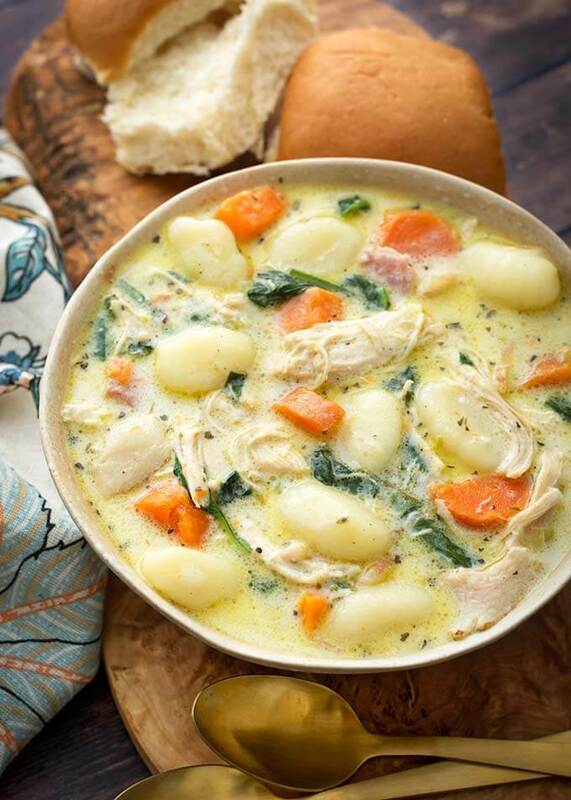 We are expecting snow tomorrow and I really want to make this cozy soup. I don’t have an Instapot (I do have a crockpot) Can this be made in a stock pot on the stove or would the crock pot be the better way to go? And do I need to change any directions? Thanks in advance! This was sooo fabulous! This is the first recipe I’ve ever made in eight years that the’boy’ has mentioned that he could taste so many flavors in one bite. This is a keeper!!!! Hi Aileen! Wow, for the kiddo to notice that is awesome! So glad you both liked it! Thank you for your review! Echoing all other reviews as this is one great recipe and so tasty. Thanks for sharing this and other recipes for the instant pot which is a great device. Thanks Dale! I’m glad you liked it! I tried the soup with sweet potato gnocchis instead of regular potato gnocchis and it was so good. What a great substitution! Yummy! My daughter in law suggested making this. She made it last night and they loved it. Mine is ready to be served…looks so good. I will serve it with homemade pumpernickel bread. Yum! Hi Sue, I hope you enjoy it! Pumpernickel bread is so underused these days! Yummy! Thank you for your review! Hi! We love this recipe in our house and make it regularly. Did you change something recently? We swear the seasonings are different and some of the instructions are missing (like when to add the cooked bacon). If we could have the original recipe that would be amazing! Or just let me know the changes and I’ll print and edit just for us. We appreciate you! Hi Sarah, the only difference is not removing the bacon, then adding it back right before pressure cooking. The seasonings and amounts are exactly the same. Oh my gosh!!! This is hands down the best soup recipe I’ve EVER made!! The flavor is phenomenal!! Thank you for sharing!! Yay! It’s my second favorite, though sometimes my first, lol! Thank you for the nice review! So glad you liked it! I made this last night for my 11 daughter last night and she’s excited we’re having it for leftovers tonight! Awww, that’s sweet! My 10 yr old granddaughter loves this soup, too! Thank you for your review! Could I use frozen chicken breasts instead of thawed? If I’m having to use frozen chicken, do I need to cook it longer than 9 minutes? Not unless the breasts are larger than 9 oz each. If so, add 2 minutes. Oh my gosh, this is delicious!! Very flavorful. Deeeelish! Can’t wait for leftovers for lunch! This was my first IP meal, other than making some plain rice as a test. I was so excited all day to try it, I swear I had butterflies! It was phenomenal and so easy. My husband loved it. Thank you so much! That’s awesome, Amy! Thank you for your review! Could you use half and half instead of full heavy cream? Hi! I have a rotisserie chicken already cooked and want to use it instead. How do you think I should alter the process? Just add the cooked chicken in after the pressure cooking is finished. Followed the recipe to the letter. The soup had a nice flavor, but seemed a little one note. Perhaps some additional spice like more black pepper or some red pepper flake. The soup was also in the thin side. I added some cornstarch to give it more body. Good solid base rexipe, but could be improved with some tweaks. I had high hopes for this recipe especially with all of the good reviews. I followed it perfectly and was very disappointed along with the rest of my family. Very bland! Had to add more salt for flavor which I didn’t want to do. TBH I’m shocked! Are you sure you made THIS recipe?! This has a ton of flavor, and if you didn’t think so something had to have happened! Well, sorry to hear you didn’t like it. Can I use 2% milk or condense and 1/2 the recipe? Yes you can, it will be less creamy, but should work just fine! You can cut the cook time down to 4 minutes. I am new to the instant pot but this came out perfect. I will definitely make it again. My family loved it!! Thank you for the recipe. This was delicious!! Definitely a keeper! My husband loves it and he can be picky. Thanks for the recipe. Will be trying more of your recipes! Hi Jennifer! Thank you so much! I’m happy you and your son (and hopefully your hubby, too) liked this soup so much! Please tell your son I said thank you, and that spinach can be super yummy in lots of recipes (my Zuppa Toscana soup is amazing with spinach tossed in at the end!). Loved it! I see 7-8 servings. What would you guess the serving size is? 1 cup? 2 cups? Can I double this recipe in my 8 quart instant pot? Not sure about doubling, but maybe increase by half? Have you tried to freeze this like a freezer meal? I have a niece with a newborn and was wondering if I should prepare and have them re-heat or prepare the ingredients and freeze so she can cook. I have frozed this and it reheats well. Since the gnocchi is potato based, it holds up well. Wow! What a great flavor profile. My guys loved it. I will make it again and again. Awesome! Thank you. I’m happy that you enjoyed it! I have made this before and loved it. I only have chicken thighs this time. Do you think that would work? Cooking time difference? HI Jessica, I’m so glad you like this recipe! We love it, too! Chicken thighs, if boneless, will cook in 6 to 8 minutes, so they should work perfectly!